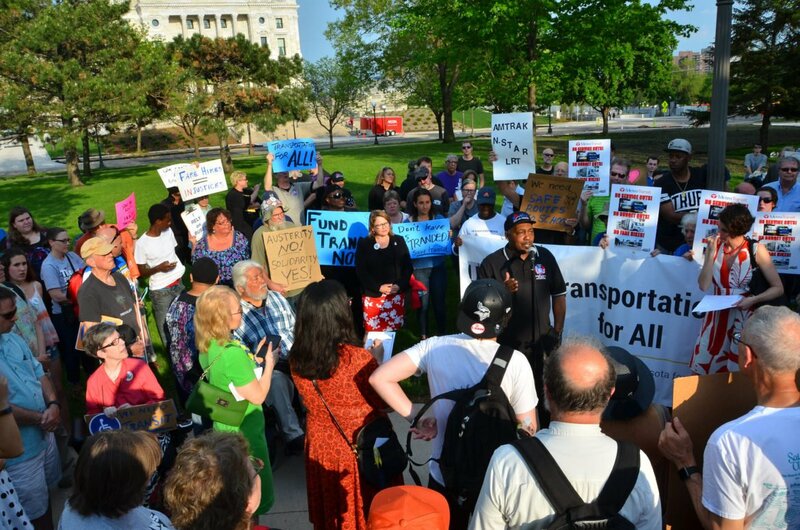 Metro Transit bus driver Doni Jones addresses a crowd during a May 16 transit rally calling for no budget cuts and not fare hikes. Photo by Mark Peterson. But just because Dayton signed the bills does not mean he approves all the measures. In an effort to bring state legislators back for yet another special session, Dayton made a line-item veto, effectively defunding the budgets of the state House and Senate themselves. Among the multiple issues Dayton wants to renegotiate – largely taxes – the governor also wants a provision making it even more difficult for undocumented immigrants to receive drivers licenses to be stricken from the Public Safety budget. Transit in the Twin Cities will receive a one-time $70 million increase from the state general fund in 2018-2019, but will also see a projected $110 million deficit by 2020 (an increase of $10 million over what DFL lawmakers predicted last week). As a result, Metro Transit will begin planning for reduced service despite the projected population increase of 750,000 people by 2040, Dayton said. Mid-May projections estimated the Health and Human Services budget would see cuts of about $482 million, the final amount was closer to $463 million. While $18 million was included for childcare assistance, the final budget means severe reductions to services statewide, including stagnant wages for 75,000 caretakers and insufficient funding for dental services for MinnesotaCare and Medical Assistance families. Amidst a slew of approvals, Dayton did veto preemption, the labor standards measure that would have prevented cities from passing their own workers’ rights provisions like minimum wage or sick time ordinances. “Local governments can be more adept at responding to local needs with ordinances that reflect local values and the unique needs of their communities. State government does not always know what works best for every community, and may lag behind when improvements are needed,” Dayton said. No bus line in the Twin Cities showcases the wealth of experiences and backgrounds like Route 5. Metro Transit’s most popular route at more than 5 million rides per year takes the food court worker to her job at the Mall of America, gets high school students to class at Cristo Rey, stops by the skyscrapers of downtown, drops off young artists at Juxtaposition Arts and loops back around for another pass from Brooklyn Center all the way to Bloomington through some of the state’s most racially and ethnically diverse – as well as the lowest income – neighborhoods. About 56 percent of Metro Transit’s bus riders, like those on Route 5, make less than $34,000 per year. More than 44 percent of riders identify as indigenous or people of color – even though only 20 percent of the Twin Cities seven-county metro area identifies as such. Most of these riders use transit to get to work, to take their kids to childcare, to worship, to go to the doctor – to live their lives. So when the state Legislature talks about dropping $100 million for transit in 2020-2021, when they propose cuts to Medical Assistance, when they propose reductions to childcare funding or preemptively stop cities from determining what labor practices best meet the needs of their communities, the person most likely to feel the compounded effect of these measures is a bus rider, riders like Danielle Doublette. A Minneapolis resident, Doublette takes the bus every day to get to her job at an early childhood education center in Edina. Cuts to transit funding mean fare hikes and reduced bus service, things she definitely can’t afford. Taken piecemeal, the individual legislative proposals may seem like a simple belt-tightening in service of balancing a $46 billion budget. But in reality, the cuts mean that the very people who are barely making ends meet are about to see the ends pulled farther apart. In December 2016, the Metropolitan Council, operators of Metro Transit, reported they would face multi-million dollar deficits in 2018-2019. By March, independent of legislative dealings, the Met Council’s anticipated transit deficit was at $74 million. To mitigate the impact, the Met Council has proposed fare hikes between 25 and 50 cents – the first fare increase in nearly 10 years. Minnesota House Republicans responded that same month with a transportation bill proposal that would have cut state funding from the $95 million the regional transit authority received in 2017 down to $39 million in 2018, providing no funding for increased demand in Metro Mobility services, expanding transit lines for new light rail or bus rapid transit. Such a proposal would have caused a more than 40 percent decrease in transit service across the metro. But thanks to pressure from transit riders, bus drivers, transportation advocates the measure didn’t pass. Gov. Mark Dayton vetoed the Legislature’s first transportation bill on May 15, demanding significantly more and sustainable funding for rail safety, roads and bridges as well as transit. 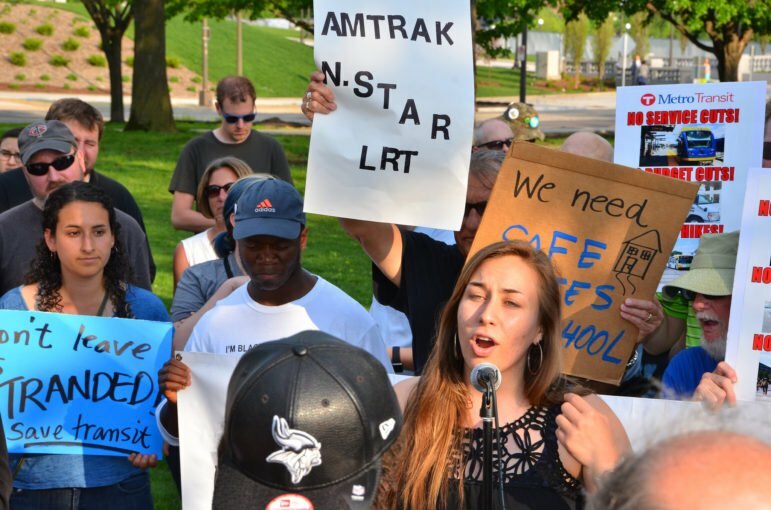 But on May 24, as lawmakers pushed past the regular session and the special session’s deadlines, the Minnesota House passed a new transportation bill largely on party lines. The new bill increases transportation spending by $300 million in the next biennium, most of which goes to new roads and bridges across the state. It also provides a one-time transfer of $70 million over two years to the Met Council, enough to stave off the deficit but not enough to prevent fare hikes. By the following 2020-2021 biennium, that funding disappears, leaving the Met Council with a potential $100 million deficit in only two years’ time. “That would lead to a one third reduction in service. It’s the local bus service that would get eviscerated,” said Rep. Frank Hornstein, DFL-Minneapolis, during floor debate of the bill. Hornstein, along with DFL colleagues Rep. Mike Sundin, DFL-Esko, also decried the use of general fund dollars rather than finding another more reliable revenue stream. “By doing this, we’re robbing other programs we’re obligated to fund. It raids education and social safety nets,” Sundin said. Author of the transportation bill Rep. Paul Torkelson, R-Hanska, said the general fund has a less than 1 percent decrease projected for the 2020-2021 biennieum – and that money from county sales tax may soon become available for transit projects. Celeste Robinson. Photo by Mark Peterson. For Celeste Robinson, a transit rider and organizer with 15 Now, fighting to maintain the transit services we have at the cost of other programs is frustrating. She said that when the Legislature puts so little toward transit, but gives $650 million in tax credits with special provisions for farmers or business property taxes, those actions show which communities are prioritized. With fare increases on the horizon, transit riders have to contend with an additional expense on already tight personal budgets – budgets that are under pressure from all sides. On May 9, the Minnesota Legislature passed a health and human services (HHS) budget that reduced general fund spending on HHS by $482 million. Chief among the many cuts was a refusal by Republican lawmakers to pay for inflationary increases in Medical Assistance, Minnesota’s version of Medicare, cutting a total of $545 million by 2021, according to Ben Horowitz of the Minnesota Budget Project. In addition Republican lawmakers proposed an audit that would cut $140 million from HHS, but in the process could also reduce eligibility for low-income families with children on Medical Assistance. The bill also included steep cuts to childcare assistance. However, one can’t say that the bill was all cuts. It did include a minor increase in relief for families who are part of the Minnesota Family Investment Program (MFIP), the state’s version of welfare. Under the original Republican proposal, families would receive on average an extra $13 per month. MFIP has not received an increase since 1986. The increase would not even cover a family’s increased transit fare costs. “When you balance your budget on our backs, when you force low-income people to bear the cost of your budgeting shortfalls, you are committing violence against us. You are fundamentally undermining our ability to be healthy, to be safe, to be productive workers, to be available family members, to live our lives as human beings,” Robinson said. Dayton vetoed the HHS budget on May 12, calling the bill “reckless and foolish” to even propose when there’s so much uncertainty over federal healthcare funding. Lawmakers have yet to propose a revised HHS budget. In addition, shortly after the state House passed its transportation bill on May 24, the state Senate passed its version of preemption on local labor standards, which would prevent sick and safe time ordinances in Minneapolis and St. Paul from going into effect this summer and preemptively stopping any debate about a $15 minimum wage at local levels. More than 71,000 workers in Minneapolis would see a pay increase should the city pass a $15 minimum wage, giving them access to resources in spite of a slew of statewide cuts. Dayton has already declared he would veto any preemption bill that comes to his desk. Protesters have continued to occupy the governor’s office and the State Capitol since May 23 to ensure that he does so. When the state House and Senate chambers opened for the day’s debates on May 24, chants of “Veto Everything!” and “Shame!” reverberated in the marble halls. The protesters were prompted by a provision in the public safety budget that would prevent the Department of Public Safety Commissioner from any further administrative change to the lawful status requirement for drivers’ license applicants, including undocumented immigrants. “Given that we believe that the Public Safety Omnibus bill should not be carried over the backs of immigrants, we stand strongly in solidarity with the rest of Minnesotans affected by anti-worker and anti-prosperity bills and request a complete veto of all until they come back clean without anti-protest provisions, anti-people anti-worker, and without anti-immigrant/anti-rulemaking provisions,” said Felipe Illescas, public policy manager for Pillsbury United Communities in a statement. The special session resumes at noon on May 25. Contact your local legislators, comment on the Met Council’s fare increases, or join the protest. Southwest Light Rail Transit (SWLRT) is the most expensive public works project ever proposed in Minnesota.